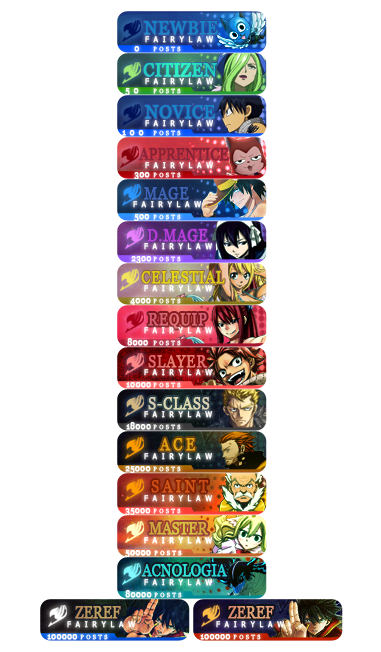 Fairy Law is an alternate universe Fairy Tail Role Play forum running on xenForo forum software. It was created on August and has been running smoothly for the past few months. If you're interested please read the following and register and Fairy Law for an enjoyable time. One account / character - a new account for each character (maximum of two). Our sub account feature allows you to add the two accounts and link them together, although you still have to log out to switch between the two. Until an easier system is placed, we'll be following this method. A sub account for each major NPC you control - along with your main characters, there may be those non-playable characters that help strengthen your plot and character. We allow you to easily create a sub account using our sub account system. A large encyclopedia which holds various information regarding the species that roam Earthland as well as a detailed description on the different systems of each country (which is still under progress). Evil Characters - those who break the rules set in place - have the chance to earn a bounty and become a wanted fugitive by the world government and the magic council! This makes your character face dangers in a life threatening environment.